Several factors contribute to hypertension, including lifestyle factors, environmental factors and stress management. Adjusting to and addressing each of these factors can play a strong role in helping to maintain normal blood pressure. Supplements may also play a role in maintaining healthy blood flow and improving overall health. Opti-BP™ is a unique blend of nutrients and herbal extracts that may help support normal blood flow through our cardiovascular system. Opti-BP™ contains 70mg per dose of Co-enzyme Q10, a dosage that has been shown in numerous studies to help support normal blood pressure. The primary action of CoQ10 in reducing hypertension is believed to be vasodilatation, via a direct effect on the endothelium and vascular smooth muscle. In 2007, a large study reviewed over 12 clinical trials (362 patients), trials involving the use of CoQ10 in supporting normal blood pressure. These studies showed that CoQ10 can help play an important role in maintaining healthy blood pressure and cardiovascular health. 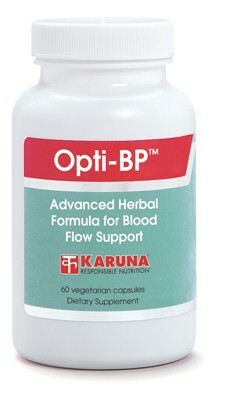 Karuna’s Opti-BP™ contains natural herbal ingredients that can act as a mild diuretic. Diuretics cause the kidneys to remove more sodium and water from the body, which helps to relax the blood vessel walls, thereby lowering blood pressure. Several herbs in Opti-BP™ have been found to have mild diuretic properties, including Dandelion Root, Parsley and dried Cranberry juice. Also present for their documented benefits are Elderberry extract, Coleus forskohlii extract, Hawthorn berry, Pine Bark extract, and odor-controlled Garlic extract. The Department of Medicine, at Mt. Sinai Medical Center in New York, reported that a deficiency in Co-Q10 was an important contributing factor to cardiovascular health (Res Commun Chem Pathol Pharmacol 11:273; 1975). In humans, a deficiency of co-enzyme Q10 was found in 39 percent of patients with elevated blood pressure, compared to only 6 percent of those with normal blood pressure. In this study, patients taking 60 mg of coenzyme Q10 for eight weeks resulted in a 10 percent or greater decrease in blood pressure. (Res.Commun Chem.Pathol.Pharmacology; 1:129; 1981). Possible cardiovascular effects of the herb Coleus Forskohlii involve the lowering of blood pressure by increasing cAMP (cyclic adenosine monophosphate) levels throughout the cardio-vascular system. This results in the relaxation of the arteries and a corresponding reduction in blood pressure. (Planta Medica, 51,473-477, 1985). A Finnish study of 72 middle-aged subjects examined the effects of consuming two servings of berries daily, with anthocyanins representing the dominant flavonoid at levels around 275 mg per day. The berry group experienced a reduction in systolic blood pressure of 7.3 mmHg, along with 5.2% increase in HDL. ( Am J Clin Nutr. 2008;87:323-31). 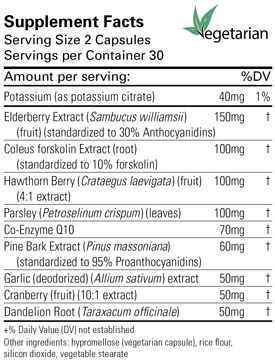 Proananthocyanidins were discovered in 1947 from various extracts of maritime pine bark. These compounds can increase plasma anti-oxidant capacity, and scavenge free-radicals. (Int J Clin Pharmacol Ther. 2002 Apr;40(4):158-68). Researchers found that Dandelion caused an increase in the volume of urine output after several days of oral administration. (J Altern Complement Med. 2009 Aug;15(8):929-34). Suggested use for adults: Take one (1) capsule twice a day with a meal, or as directed.